Continuing our tradition of special pjs for Christmas morning, there were new pjs again this year. When I found the perfect penguin pjs for Juliana I was thrilled and ordered 3 sets. Then I noticed that there was an adult version as well so I added that to my shopping cart. I was about to check-out when the men’s version appeared and I did a search for penguin pjs and found that there were matching men and boys pjs in darker blue so I ordered those for the boys instead. 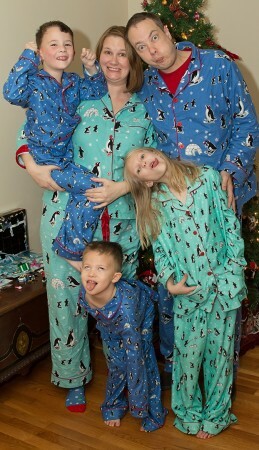 So this year, everyone had matching penguin pjs on Christmas morning. 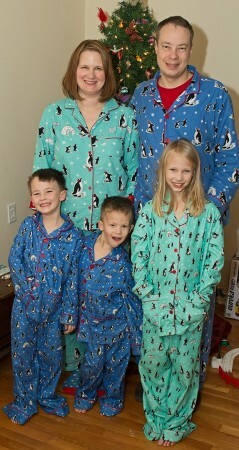 The kids were very excited that we matched and I love this year’s edition of penguin pjs. 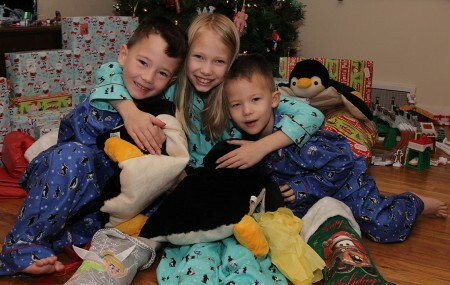 These three before we opened presents Christmas morning. The whole family and no photo shoot is complete without silly faces. Cute! I love that tradition – wearing them all day just relaxing.